Tailwaters like the Bighorn River in Montana offer a unique opportunity for both drift-boat fishing and wading. THROUGH THE FRONT WINDOWS of the fly shop, I could see the motor home turn off the highway, crunch across the gravel of the parking lot, and roll to a stop. After a minute or two, two tourists, a man in his seventies and a boy of about ten, emerged, walked hesitantly throught the open door, and made their way to the front counter. The old man stuck his chin out slightly and looked across the counter at me. A tough assignment, I knew, but one that is handed out regularly in fly shops—guess the skill level of a customer, narrow a general fly selection down to one or two patterns, and condense an instructional guide trip down to a minute or so at the fly bins. I started my interrogation with the most important question, if I were to garner enough specific information to help them with selecting flies and suggesting fishing technique. Montana’s wealth of trout streams show an incredible variety, from tiny mountain rivulets to rivers the size of the lower Clark’s Fork or the Yellowstone between Big Timber and Columbus. Becoming a Montana trout expert by fishing every stream might sound intriguing. Even if fishing all of those thousands of miles of trout water were physically possible, it would turn recreation into drudgery, but there is a better way. Making sense of this infinite variety depends on the angler’s ability to categorize it into different water types. There are two sets of categories that determine how we fish a particular piece of water effectively. One division is defined by the source of a stream: spring creeks and tailwaters on one hand, and freestone streams on the other. Water source has important consequences for angling because it determines the kinds and numbers of foods that we imitate with our flies, as well as the most effective range of techniques. The second set of categories, what most anglers think of when we discuss water types, is based on the slope the stream is moving across, because stretches of water that reflect varying combinations of current speed and depth will call for different techniques of presentation. In the 1970s, West Yellowstone author Charles Brooks taught a generation of anglers about these water types, and his terms for them—from very fast cascades and rapids, to fast water runs and riffles, and finally to slow moving pools and flats—are the most sensible to have appeared in print. Spring creeks owe their high densities of insects and fish to stable year-round water temperatures. Spring creeks, as the name implies, receive most of their flow from perpetual springs. This water source results in a stable environment, nearly constant both in flows and water temperatures. The geology that results in such springs reaching the surface often coincides with alkaline water chemistry, an ideal environment for aquatic insects and crustaceans, favorite foods for trout. Hard water also fosters rich growth of aquatic vegetation which provides cover for the fish. A stream with a rich food supply, lots of cover, and stable conditions will support very dense populations of trout. The presence of lots of fish—and lots of bugs to imitate with artificial flies—makes a spring creek a mecca for fly anglers. Some of the best in the world are found in Montana: Armstrong, Nelson’s and DePuy’s in the Paradise Valley, O’Dell in the Madison drainage, Big Spring Creek near Lewistown, Thompson and Benhart’s in the Gallatin Valley, Poindexter Slough, and numerous smaller streams. Tailwaters are rivers whose flows are drawn from reservoirs. If the water is drawn from the cold layers at the bottom of the reservoir, and the flows are kept fairly stable, the result is a huge artificial spring creek. The numbers and size of trout that can be supported by a tailwater are staggering, as anyone who has fished the Bighorn or upper Missouri or Kootenai can attest. Most spring creeks and tailwaters are found in the lower reaches of river valleys, where the gradient is not terribly steep. This means the water types encountered are not that varied—typically, a succession of gentle riffles and flats. The slow water allows for the deposition of smaller gravel and silt, and this fine material harbors mostly small insects. Another general rule with spring creeks and tailwaters is that, although they produce huge numbers of insects, there are usually a few hatches of certain bugs that predominate over the course of the season. The fish respond to having lots of the same food on the water for long periods by becoming “selective”, that is, eating one food at a time, almost to the exclusion of all others. Contrary to popular fishing clichés, selective fish are not showing any kind of intelligence. Selectivity is just a natural response to a heavy and predictable supply of food. Given this broad characterization of spring creeks and tailwaters, several observations about fishing them can be made. With fish feeding selectively to heavy hatches of small insects in slow, clear water, the angler is forced to fish small, highly imitative flies. The fly also needs to be presented in a very lifelike manner, with little or no drag in the drift. This usually means fishing with fine leaders—6X and 7X tippets are the order of the day. To some, this “technical” fishing with tiny flies and delicate tippets is the ultimate challenge in fly fishing; to others, it’s strictly for sissies. Try it, and decide for yourself. Freestone streams are fed primarily by direct runoff, by rain or snowmelt. Such streams tend to fluctuate widely in flow, the muddy torrent at the height of spring runoff slowing to a trickle in late fall and winter. Because of the variation in volume, there is also a greater variation in water temperatures over the course of the season, since the temperature of the ambient air has greater effect. Though most big rivers like the Yellowstone are ideally suited for drift-boat fishing, many parts provide good wading flats, especially later in the summer as water levels drop. The food supply in a freestone stream is not as rich as in a spring creek, but it is usually more varied, and it may include very large insects. (Large insects need larger crevices to hide in, and the rubble and large rocks in freestone streams provide this.) With less volume but more variety of food drifting by, the fish are forced to feed more opportunistically. A fish that is overly selective on a typical freestone stream will starve to death. For the angler, this means that fishing less imitative or even attractor flies—those that don’t imitate a single food precisely, but suggest a variety of foods—are the most effective. Most freestone streams have a fairly steep gradient. Fast water, particularly high springtime flows, moves smaller gravel and sediment downstream, so the mix of materials on the stream bottom is mostly gravel, larger rocks and boulders. The fast water types encountered include rapids, runs, and shallow riffles. Where the gradient becomes less extreme, the water slows into pools. The broken surface of the water makes it more difficult for the angler to spot fish, but it is also harder for the fish to see an approaching angler or notice a sloppy presentation of the fly. Fast water and large rocks also make for more challenging wading. We can now look at the variety of Montana’s streams, and consider some specific strategies. 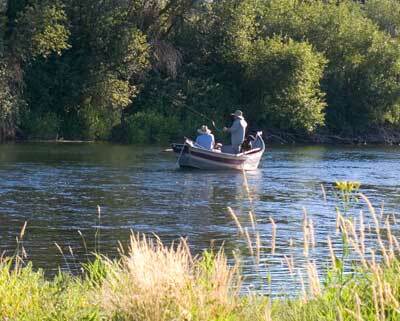 On big Montana rivers, one key is to use a boat. Some fishy spots are simply impossible to approach by wading because of depth. Even on large tailwaters where you may prefer to get out of the boat to fish, a drift boat or raft will allow you to cover much more water in the course of a day. If you don’t own a boat, make friends with a neighbor who does, or hire a guide. State fishing access sites are a boon to the angler, but recognize most casual wade fishing takes place in the immediate vicinity of these sites, so drift or hike away from them for better fishing. On big freestone rivers like the Yellowstone or Big Hole, one productive spot to look for is a riffle corner. At any bend of the river, the main current will sweep to the outside of the bend, and the water will slow at the inside corner—the fish will hold where the fast water and slow water meet. Look for the biggest rainbows at the very top of the riffle corner. If you catch nothing but whitefish, fish faster water further up in the riffle, or jump in the boat and move to a new spot. If the river you are fishing does see a lot of boating pressure, expect the traffic to push fish into less obvious spots. Get out of the boat and explore side channels that are too small for a boat to float through. If the three boats ahead of you all float down the strong bank (the bank with more current and depth), try the opposite weak bank. If there is any structure—like rocks or weed beds—to break up the current, don’t be surprised to find fish in the middle of the river, especially if all of the drift boats are hugging the banks. This was proven to me several years ago during an August float trip. My clients had caught several nice fish with hopper patterns, when I decided to make a switch from one bank to the other. As I rowed quickly across, one client stopped to admire the scenery, his hopper skating behind the boat like a drunken water skier. We both glanced back just in time to see his dragging fly disappear in a spray of water. He tried to set the hook, missed the fish, and then fell into his seat, laughing at the big stupid fish that had tried to commit suicide on his fly. Several days later, floating the same section of river and making another ferry from one bank to the other, another fish attacked a dragging fly in the middle of the river. Looking around, I realized it was almost the same spot, and then spotted several submerged boulders in the tail of the pool we were crossing. I only have to be hit over the head so many times to learn a lesson. The next time I floated that piece of water, I had my clients set up properly and we caught fish. Be willing to experiment, look for patterns in what you observe, and be ready to learn from mistakes—or luck. On smaller freestone rivers and large creeks, like Rock Creek, the Gallatin, the Boulder, and parts of the upper Madison, the water is a mix of riffles, runs, and small pools. Sections of very fast current with lots of boulders and logs create “pocket water”, where the fish are forced to hold in small pockets of slower water on the upstream and downstream side of the obstructions. The key here is controlling the drift of the fly, and this means fishing a short line and getting close to the pocket. The aggressive wader has the advantage here. Don’t forget the pockets on the upstream side of the obstruction. On streams populated with both browns and rainbows, expect the nice brown to command the face of the boulder, and you’ll find the rainbows on the edges where the current breaks around the side of the boulder. Many anglers look down their noses at fishing small mountain streams (“cricks” to native Montanans) because the fish are small and the fishing is too easy. It is true that the food supply is often scanty, so the fish won’t be huge, and they are usually aggressive feeders. But after taking neophyte guide clients to such places, I have come to realize that this fishing is easy only after the fly is on the water. The real challenge here is getting up and down the rocky banks, keeping the fly out of overhanging tree branches, and being able to cast accurately at short range. Tactics are not complex, and fly selection can be very simple. 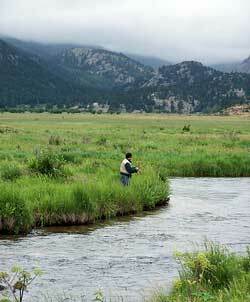 A handful of small dry flies—Stimulators, Elk Hair Caddis, small hoppers, or Royal Wulffs—is sufficient. 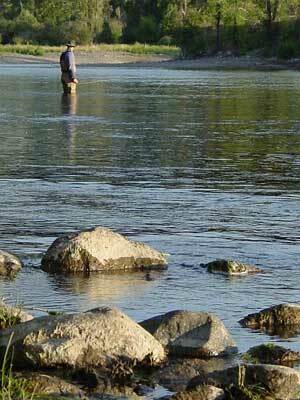 If the water is too cold for the fish to rise to a dry fly, you have come too early in the season. The water is usually a succession of riffles and miniature pools, and I usually fish upstream, wading right up the middle of the creek. This keeps you away from streamside brush and trees as much as possible, and if you spook a fish, it will race downstream but won’t scare the fish in the next pool upstream. Since the trout will come to the fly readily, fish thoroughly but quickly—get a couple good drifts through each likely spot and move on. Be sure to hit any deeper pockets, especially around log jams, but don’t forget to cover the shallow tailouts of the pools—cutthroats love these places. On many small creeks, canyon walls and surrounding forest protect the water from the sun. Fish will hold in the shady spots on warm summer days, but the lack of sun keeps the water from warming all morning in the fall, so the fishing day in September and early October is usually restricted to a couple of hours in the afternoon. I gave up small stream fishing for twenty years when I was too concerned with catching large fish. I have rediscovered it in the last few years, and it has taken me back to some of the best reasons to fish: beautiful country to hike in, a reasonable chance at solitude, and the simple beauty of a wild fish materializing under a dry fly. Take your dog, a sandwich, a good beer, and remember that fishing is supposed to be fun. And that grandfather and grandson who wandered into the shop with no idea of where in Montana to catch a trout? I talked them into a big purchase of four Royal Trudes and directed them to a creek that I make a point of not mentioning to tourists (or other guides, bait fishermen, or Republicans, for that matter). I cautioned them to keep their flies out of the alder and pine branches, and to try to get the fly to drift like a piece of bark thrown on the water. I’m sure those cutthroats showed them a good time.